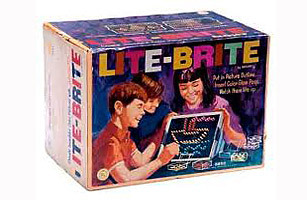 When Hasbro released its new art toy Lite-Brite in 1967, it was hard to imagine that young artists would become so attached to a little light box. The design was perfectly simple: a grid, backlit by a lightbulb, was covered by black sheets of paper. Kids could poke small, translucent plastic pegs through the paper, causing them to light up in the pattern of their choosing. Since the creation of Lite-Brite, Hasbro has included prepatterned images of Scooby-Doo, Darth Vader, My Little Pony and even Mr. Potato Head. Of course, for each masterly plotted creation a child managed to plug in piece by piece, there were at least a few of the pointy little pegs waiting to be stepped on. It was worth every yelp.